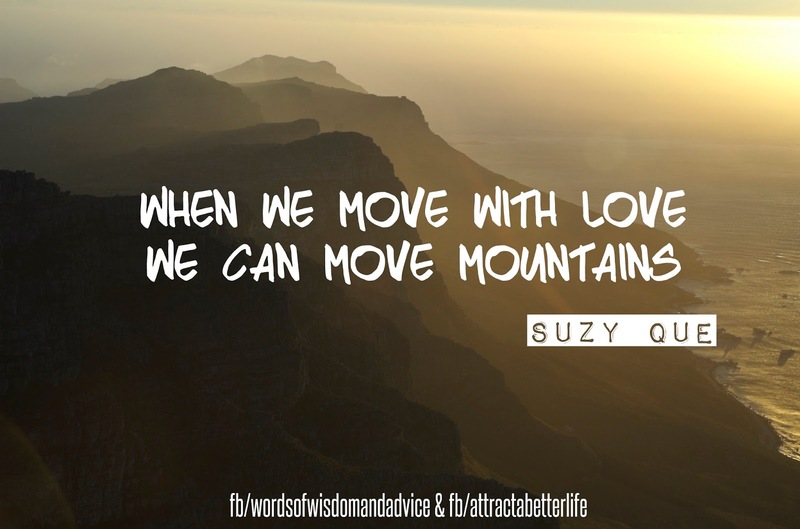 "When we move in love, we can move mountains," says fellow blogger Suzy. Whatever "mountains" we may be facing in our lives, we can overcome them. Facing a "mountain" in your own life? Staring at it won't move it. Ignoring it won't move it. Cursing at it won't move it. Taking action will. Fearing it will only make it grow bigger, making it even more of a challenge to overcome. And the sooner you act, the better. You can stare, ignore, and curse all you want, but until you take some kind of step toward removing it, it will loom over you indefinitely, haunting you like some specter. Mountains give the illusion that they are large as they cast their dark shadows over us. We are so busy cringing in fear that we fail to see the possibilities. We see only impossibility. But no mountain is too large. Confucius said moving a mountain begins by carrying small stones. In other words, start by taking small steps. Approach it systematically, not fearfully. Break it down into manageable units so as not to overwhelm yourself. Understand your part in creating it. If you are facing a mountain of debt, examine the actions you took to build it. Understand your part in dismantling it. After you examine the actions (and beliefs) it took to grow that particular mountain, it's time to take responsibility by reversing those actions. Own them and move forward by changing your perspective from one of fear to one of acceptance. Becoming aware of past actions will help you to avoid repeating them in the future. The most loving thing you can do is to take action. With each step you take, that mountain begins to disappear, until you are back on top of the world. What "mountains" are you facing in your own life? And what steps are you taking to overcome them? Mountains always seem big in the afternoon but as the day sets in...I tend to feel that nothing is as important as my breath and having family. Ah, how true, Ruchira. When we have our health, our breath, and our loved ones, we can conquer anything. Thank you. Penny :) And thanks for sharing this! I appreciate it. Penny I am so honoured that you chose some words I put together and made it a quote. Thank you. When you take it a step at a time, and have determination, you can do anything...even move mountains. Amen,Kathy! We no longer see it as a problem, but as the opportunity to rearrange our priorities and to learn, grow, and make a difference in our lives and in the lives of others. Thank you for stopping by. Another great post! When most people say "take action" I think people hear "take effort". When I say "take action if inspired" it means to first do something to change yourself on the inside and IF outside action is required, it will be inspired action. You could to it all day and it will not feel like effort. 17 seconds of pure, positive, un-contradicted thought is equal to 2000 actions hours. You could really NEVER do enough physical Universe action to make up for lower vibration or negative thinking. So, yes, I agree with you...TAKE ACTION. Just take the right action and start with your own feelings and beliefs and vibration and make the rest easier for yourself. Wow, what a great story to illustrate what taking action does in someone's life! That person's life has changed for the better because of you and your wisdom! Awesome! I like your phrase "take action if inspired" because the connotation is much more positive than "take effort." And you're right, when you take inspired action, you could be doing something all day and it will not feel like effort at all...in fact, you are so energized that you may not want to stop! What an awesome feeling! Love is truly the mover of all things. Thanks, Gena! Love is the power. Sending love to you, too.